The world record holder in pole vaulting may lose her title as Ambassador to the Youth Olympic Games. Yet another scandal erupted around one of the most decorated athletes in the world, Yelena Isinbayeva. Media from around the world quoted the words of the president of the International Olympic Committee, Jacques Rogge, who said that the IOC will soon consider if the Russian athlete is worthy to be an ambassador to the 2014 Youth Olympic Games in China. This announcement came after Isinbayeva made a statement supporting the law banning the promotion of gay relationships to minors. In mid-August, during the World Athletics Championships in Moscow, Isinbayeva, responding in English to questions from reporters, expressed her opposition to the boycott of the Olympic Games in Sochi because of the law that was passed in Russia prohibiting the promotion of non-traditional relationships to minors. "I do not support the boycott. I am opposed to this controversy and against what is happening. If politicians or any other people who have no relationship to sports want to use us in this boycott, I'm against it," said Isinbayeva. In addition, the pole-vault star supported the idea of the controversial law, urging the international community to respect the practices and values in other countries. "We are against promoting such relationships, but we do not mind what choice a person makes or with whom he builds a relationship. 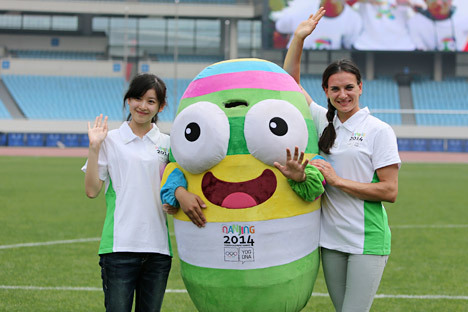 When we Russians go to other countries, we respect the local laws," said Isinbayeva. After the press conference, some of the world's media accused Isinbayeva of discriminating against gay athletes. However, the day after the widely publicized quote, the athlete claimed that she had been misunderstood. "English is not my native language, so I was not understood properly. What I wanted to say was that people should respect the laws of other countries—especially when they are guests. I respect the views of other athletes. I strongly oppose any discrimination against homosexuals because of their sexual orientation: It is contrary to the Olympic Charter," the world champion said. However, the statement of the famous athlete did not go unnoticed by the International Olympic Committee. On the eve of the 125th IOC session in Buenos Aires, where the host city will be chosen for the 2020 Summer Olympic Games, IOC President Jacques Rogge made it clear that Isinbayeva's statement on the law banning gay promotion will be taken seriously and may result in certain sanctions. "We will consider this issue in the near future," Rogge said in response to journalists' questions about whether or not it was necessary to strip Isinbayeva of her ambassador status after her speech. Isinbayeva's coach, Yevgeny Trofimov, does not see any reason to punish the athlete. "In my opinion, all this talk is no more than political PR," Trofimov told Izvestia. "Jacques Rogge received a notice from those who initiated this scandal, and [he] must turn it over to the IOC for discussion. It's standard procedure. But our opponents decided to play dirty and create another scandal for a famous athlete. Yelena Isinbayeva set 28 world records, was named the best athlete in the world three times, was the first women to overcome the five-meter mark in the pole vault—and yet some journalists associate her name only with the scandal involving a law banning gay propaganda. It has really upset us all." In June 2013, the Russian State Duma adopted a law that bans "promoting non-traditional sexual relationships" to minors. The new law was met with disapproval in the West, causing some to call for a boycott of the upcoming Winter Olympic Games in Sochi, which will be held on February 7–23, 2014. Based on materials from RIA Novosti and Izvestia.